Victim of car-ramming and stabbing at Kfar Adumim Junction, Rabbi Shmuel Shapira, recounts harrowing moments of Sunday's attack. 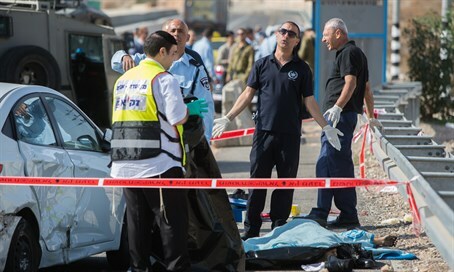 Rabbi Shmuel Shapira, head of the Zvia Eilat yeshiva high-school, was traveling to the capital on Sunday morning when he and his staff were attacked by a knife-wielding Palestinian terrorist. As they made their way to a training session, a Palestinian man in a taxi tried to run over Rabbi Shapira and his staff at Kfar Adumim Junction, northeast of Jerusalem. Failing that, he exited his vehicle brandishing a knife. "We were en route to Jerusalem; near Mishor Adumim, a yellow Arab taxi went into us, "Rabbi Shapira recounted to Arutz Sheva. "We made a few turns and the car hit us again. As we exited the car to see what was going on, the taxi driver ran toward us with a knife." "One of the passengers in our car had a gun and managed to shoot him. I was close to the terrorist. I was able to get back into the driver's seat and lock the vehicle. Then, he was hit." Rabbi Shapira suffered light injuries to his left arm during the attack; he was brought to Hadassah Medical Center for treatment. "A Palestinian man at Kfar Adumim junction in a Palestinian taxi tried to run over civilians. When he failed he exited the car with a knife and attempted to stab. The terrorist was shot by a civilian and died of his wounds," a police statement on the attack said.